As a small business, your reputation matters. And in today’s world how you are seen online plays a large role in the amount of business you will garner. That is why SEO and internet marketing are integral to the success of local plumbing companies. Did you know that if your website has broken links it will damage your online presence? If you want a proper, complete web presence you need a website that is free of broken links. 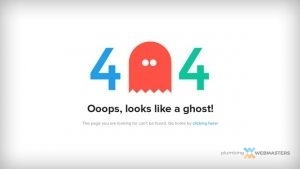 Broken links occur when someone clicks on a link and instead of opening the proper web page it provides a “404 error.” This error is often accompanied by a snarky quip about why the link is gone in an attempt to provide humor to the situation. But the bottom line is, the page that should be there isn’t. 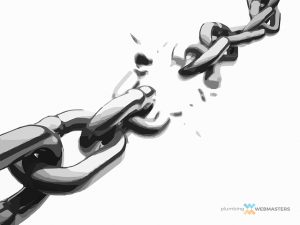 Broken links damage your web presence in a variety of ways. For one thing, any internet user knows that it is incredibly frustrating to click on a link and find an error page instead. When a potential client clicks on a link and it is a page that no longer exists, they will likely move on to a different company and not try to load anything else on your site. People are extremely fast paced when it comes to the internet and any error will deter them from your site. This in turn gives you a bad mark with Google. People are leaving your site rapidly, not spending time reading your content. Google sees this and puts you lower on the list for plumbing sites. And finally, ultimately it will damage your conversion rate. What good is a wonderful website if you do not see a conversion to actual paying clients? To convert would-be-clients to actual clients you MUST have a website that functions properly. And sadly, bad news travels faster than good news. A study Kissmetrics performed showed that 44% of users will tell others about a bad experience. Fixing broken links isn’t impossible, but it is time consuming. You need your site to be constantly supervised to avoid this from happening in the first place. And you need a little tech savvy to ensure pages that move and/or are renamed get linked to properly. That is where we come in. We help plumbing companies with broken links. In fact, through the ongoing work of our webmaster gurus we ensure our clients never lose potential clients or damage their SEO due to broken links. Talk to us today about broken links and SEO and how we can change your online presence!